District Court Judge Curtis V. Gomez on Wednesday sentenced Walid John, 37 of St. Thomas, to 10 months in prison for possession of a firearm by a person convicted of a crime of domestic violence. 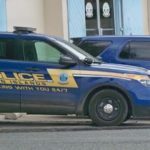 Cristian Lopez-Moncion, 35, a citizen of the Dominican Republic, pleaded guilty Wednesday in federal court on St. Thomas to possession of a firearm by an illegal alien, acting United States Attorney Joycelyn Hewlett said. A 43 year old St. Thomas man wanted on murder charges has been arrested in the state of Texas. Currup Williams was taken into custody on Wednesday morning based on outstanding warrants from the Virgin Islands charging him with first degree murder, first and third degree assaults, unauthorized firearm possession and reckless endangerment. One man was treated for a gunshot wound early Monday at the Schneider Regional Medical Center after a shooting near midnight near Simonds Alley. Rhasheel Charles, a 30-year-old St. Thomas resident, was sentenced Thursday to 60 months in prison and five years of supervised release after pleading guilty to drug conspiracy and possession with intent to distribute cocaine. Two men, one of them an off-duty police officer, were injured Thursday in the Calquon area, in a shooting incident in which a communication breakdown appears to have caused a friendly-fire shooting. C’Quan Celestine, a 23-year-old resident of Anna’s Retreat, was remanded to the Bureau of Corrections Tuesday minutes after a jury convicted him of shooting a woman and leaving her for dead. Federal prosecutors have accused a disabled man of being the mastermind behind not one but two major drug trafficking cases uncovered in 2016. Craig Richardson is one of four men indicted May 18. Gerald Mercer, 42, Jamal Haynes, 39, Makimba Barry, 39, and Craig Richardson, 39, were indicted by a federal grand jury Thursday and charged with conspiracy to possess with intent to distribute cocaine.